Last week I posted on my New Additions page some lovely pictures of some gorgeous toys that I received from Yavuz Demirrhan. 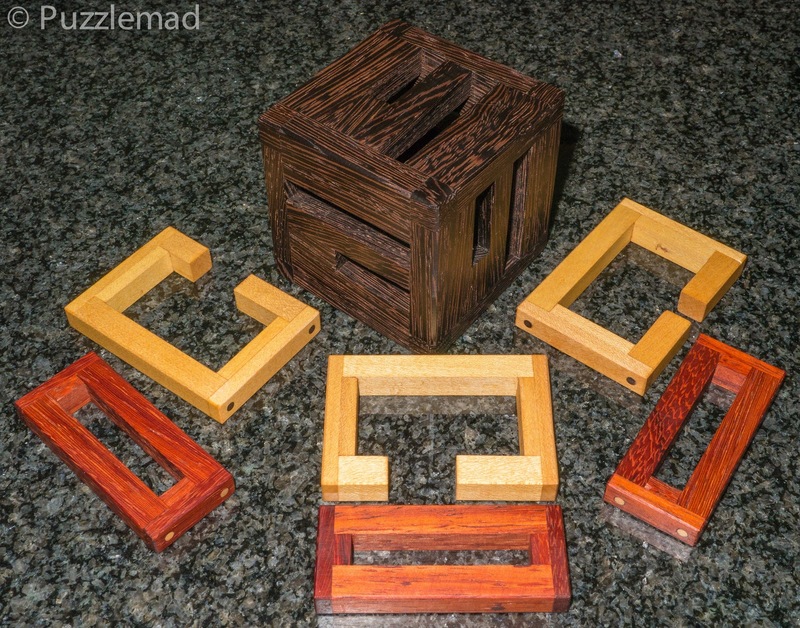 Yavuz lives in Turkey and despite struggling to obtain good quality equipment he manages to produce quite a few lovely puzzles and has very recently opened his own Etsy store. It was originally named Creacubes but apparently someone else has reserved that name and forced Yavuz to change it to his current name of Cubozone - seeing as so many of his gorgeous creations are cubic, I think the name is quite apt. My first purchase from his new store was some time ago and the delivery was very delayed because first of all Yavuz sheepishly admitted that he had taken orders for more puzzles than he actually had made (of course I didn't mind waiting - I know that quality takes time and is worth waiting for) and after he had made my lovely new toys the British customs office held them for 3 weeks before releasing them to me! I had seen them at the last MPP and was getting desperate to get my mitts on them! When they did finally arrive, even Mrs S commented on how beautiful they were! Can you spot the key piece? My initial thoughts were that it was far too simple - I got it apart in just 5 minutes. I was expecting much more of a challenge. I put the pieces aside and carried on watching the TV with "she who must be feared". I decided to stack them up for temporary storage and then the following day went back to reassemble them. Aha! Now I could see where the challenge lay! A pretty stack of sticks! The reassembly was where Yavuz intended the challenge to be. I am generally not very good at reassembling burrs from scratch - my usual pattern is to spend hours, days or weeks disassembling them and then having a fun time entering the puzzle into Burrtools which would then help me with the reassembly. I very rarely have enough memory of my moves to put the puzzle together myself. My good friend (and puzzle savant) Laurie specialises in assembling burr puzzles from scratch and even gets his long suffering wife, Ethel, to disassemble them for him. This has made Ethel into one of the best Burr solvers in the world and proves that Laurie is not actually human! 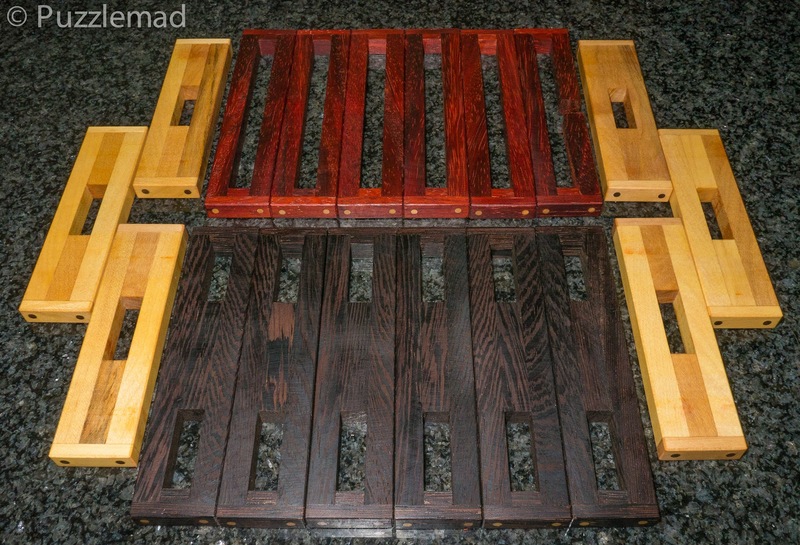 But here, with Yavuz' beautiful creation I was going to be forced to change my usual thought process (hence the title of this blog post). The following evening, whilst watching TV again with "she who must be flinched from" and with a cat on my lap, I attempted the reassembly. 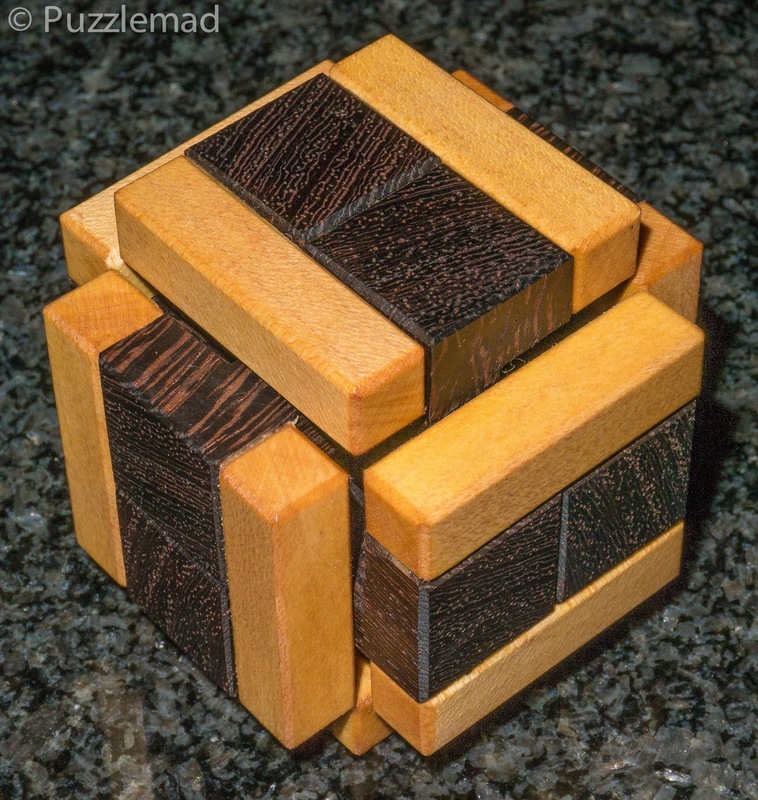 Initially I had to look briefly at a photo of the puzzle because my feeble brain had actually forgotten what the structure was supposed to look like - Man! I'm not very bright! The construction was a really fun challenge - not too tough but really good fun to work out what order things needed to be put together in. The cat was slightly miffed at being covered in lumps of wood but he lay there for the hour it took me. If Yavuz makes them again then you should snap it up - it looks beautiful on display and is fun and actually quite repeatable. In fact I have the above stack waiting for me to assemble this evening. 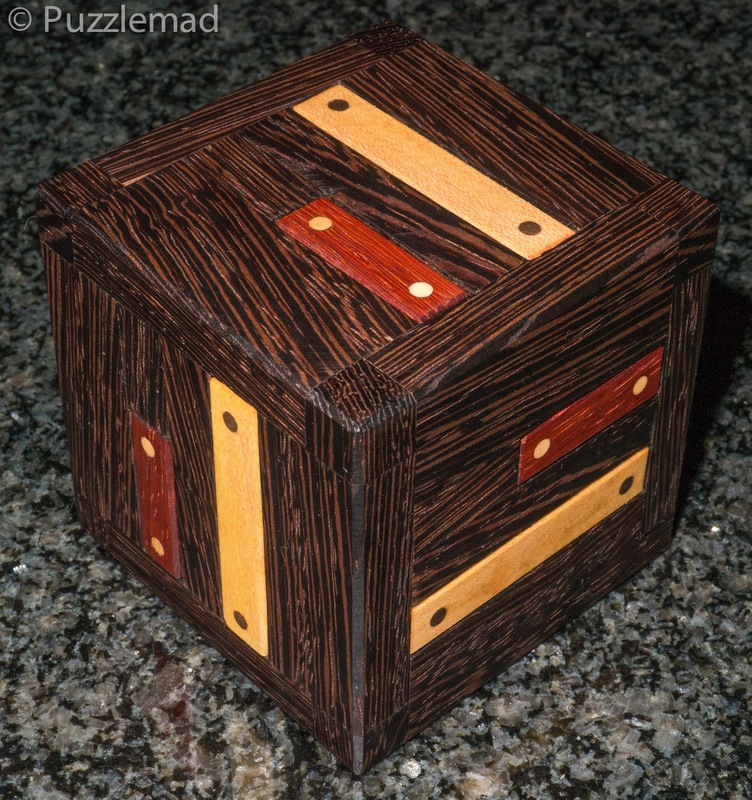 The Rubus cube is not related to the famous twisty puzzle - this is a lovely cube made from Wenge with slots cut in it for board burr pieces made from Maple and Padauk, again with the stunning dowels. 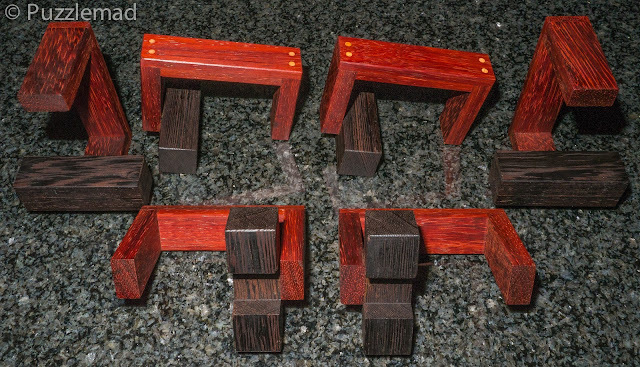 There is a fair bit of movement in the pieces and due to their simplicity it is possible to peek inside and see exactly how they are interacting. This makes the disassembly a fun and not too tough challenge with a level of 14.1.6.1.3. I managed this in about ½ an hour. The pieces were spread out again on the sleeping cat who suddenly turned over and dropped them all off onto the floor. I asked "she who must be provided with shoes and handbags" if she would mind picking the pieces up for me so that I wouldn't disturb the cat and she fixed me with the laser burning stare and then got up and grudgingly handed me the pieces along with a Whack! Ouch! 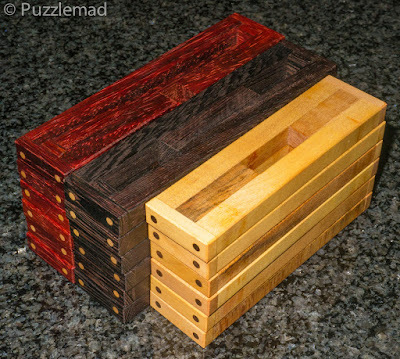 Very simple pieces - should be an easy assembly? Gulp! After I regained consciousness and put a dressing on the burn between my eyes, I realised that the pieces weren't symmetrical and I actually had no idea which went where or what order they had come out. You would think that I might learn someday to pay attention and also learn not to upset "she who has hidden weaponry" but no! as I say, I'm really not very bright! It took me the rest of the evening and part of the following evening to finally work out how to put it back together. 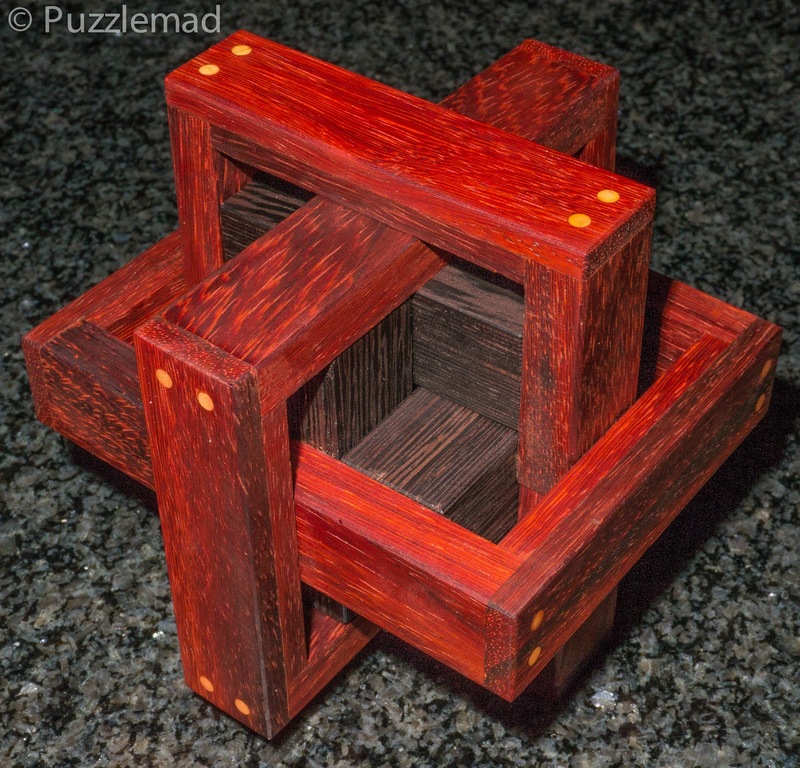 Again, Yavuz has given us a fabulous puzzle where a large part of the challenge is in the reassembly (something I just seem to have a bit of a mental block about). This puzzle has become a bit of a worry bead for me - I have done it repeatedly the last few days and if I forget the positions then it is still a challenge. Brilliant! The 6 pieces consist of 4 identical and 2 other identical burr sticks with frames attached. I got a bit cocky here and thought that I would have no problem with it. I lumped the pieces together and left them for a day. Again during an evening spent with Mrs S ("she who makes the Gods and Devil quake in their shoes") I attempted to put it back together only to discover that I couldn't seem to work out how to arrange the first couple of pieces to start me off. Yep! I can hear you screaming at your computers/tablets that I'm not very bright and you're quite correct! Mrs S heard me Effing and blinding and promptly delivered a Whack! Ouch! I shut up and kept at it. The reassembly isn't actually that hard but the crucial start is critical and it took me about 2 hours. Eventually "she who punches me in the kidneys to stop my snoring" breathed a sigh of relief when I finally got it back together. 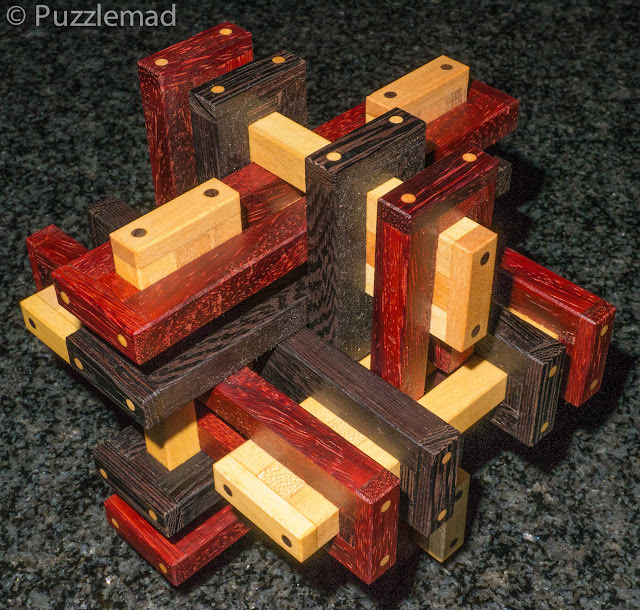 This puzzle again, is a delight from Yavuz - an unusual shape, an easy disassembly but forced me to really think to get it reconstructed. Maybe I might actually get good at these? I doubt that I will survive that long! I knew that I would never be able to reassemble this from scratch so I was very careful to do my usual progress a bit and retrace, progress a bit further and retrace, and then do this repeatedly until I got the puzzle apart. My aim (which I don't always or even often succeed at) is to develop enough muscle memory to ensure that I can reassemble it without resorting to Burrtools. Yay! I got the first piece out and quickly put it back and retraced my steps to the start. Back I went and out it came followed by POW! another stick fell out on the cat's head - I wasn't sure how it came out! Gulp! The temptation at this point would be to say "sod it!" and just complete the disassembly but I was determined. I picked up the errant stick and spent a happy ½ hour desperately trying to work out how to put it back. Yay! I got it and even shouted my joy which was followed by an evil stare and a raised hand from "she who packs more punch than Mike Tyson". I mumbled a quick apology and carried on with the puzzle - eventually, I was able to dismantle and scramble the pieces before successfully putting it back together! It is wonderful - if you are not particularly a burr person then this one is great - it is definitely possible for someone who is not good at them to take it apart and with a bit of care and attention manage to put it back together again. Perfect! So all of you should head over to Yavuz' store and support him - his puzzles are beautifully made and they may force you to change your thought processes just as they did with mine. Thanks Yavuz - I think I will be buying some more soon! "Solve one - Burn one! That way they never take up more space." If she does this then I'm running away! Whack! Ouch! Whack! Ouch! Sniffle! Be careful Pete! Spouses tend to stick together. 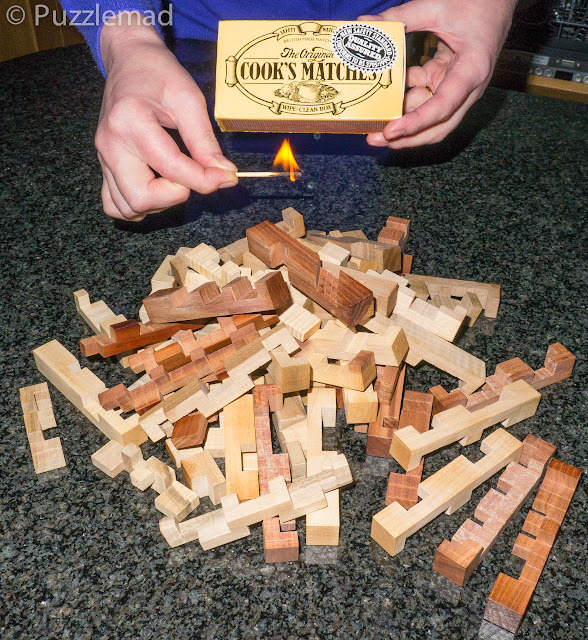 Burning all those plastic puzzles of yours would make an awful smell! Kevin I'm pretty sure mine would love that photo as well. I'd have to rename things, "Boxes and Bonfires". Hi Steve, I'd suggest you don't let her see that photo! You wouldn't want her getting any big ideas!